The Lloyd House in Lower Penn briefly came into the ownership of the Evans family as a result of Charles Evans marrying Sophie Marsh of the Lloyd in 1804. The Lloyd or Lyde was a mediaeval manor but seems to have changed hands many times. In 1771 Sophie’s father, John Marsh, “an opulent magistrate” had acquired the Lloyd House, the surrounding farmland and several other properties around Wombourne. In the following year he married Esther Bradney, one of the two daughters and heirs of Thomas Bradney, who had built neighbouring Penn Hall. The other daughter, Ellen, married into the Pershouse family of Wolverhampton. John Marsh had only one surviving son Richard Bailey Marsh who died aged 36 without children in 1820. Richard’s widow Susan Marsh lived on at the Lloyd, eventually remarrying a clergyman from Ireland, Rev William Dalton. When she in turn died in 1862, the Rev William Dalton continued to live at the Lloyd House until his death in 1880 when it reverted to the only living descendant of John Marsh, Charles Evans’s only son, Rev John Evans. 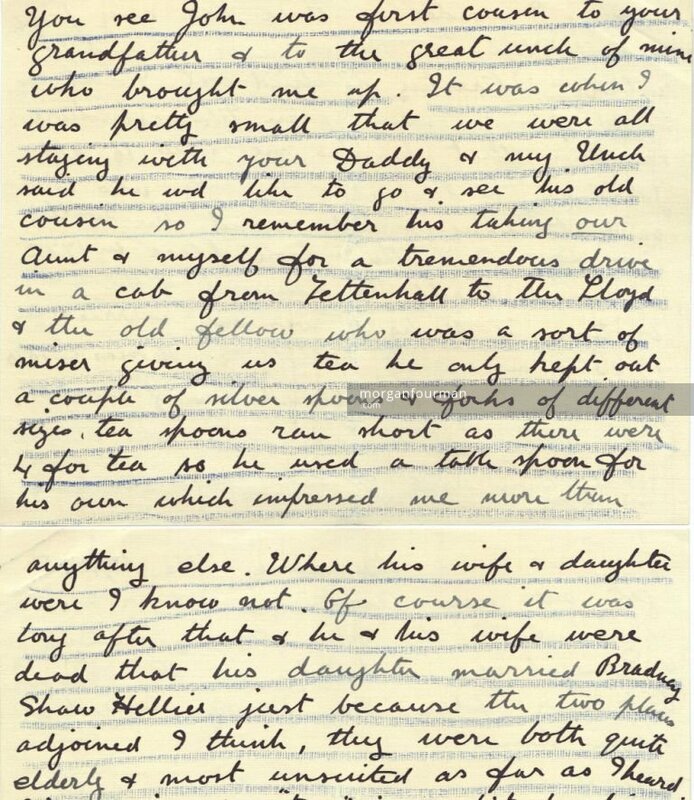 Edith Ogden writes in a letter of 1936 to Molly Evans recalling a childhood visit to the elderly clergyman at the Lloyd House in about 1882. After Rev John Evans died, the Lloyd estate passed to his only child Harriet Bradney Marsh Evans. As the main heir to the Bradney and Marsh families, the Evans name had been dropped and she became more simply Harriet Bradney-Marsh. She married her cousin and neighbour at the Wodehouse, Wombourne, Colonel Thomas Bradney Shaw-Hellier in 1899. The estate was sold not long after. One of the residents from about 1908 to 1924 was George MacPherson and his family. He was a Scottish ironmaster who had married Hilda Mary Marten in 1894, the only daughter of Edward Bindon Marten and niece of Henry John Marten. It would appear that the building still exists in some of its original form and is a Cheshire Home off the Stourbridge Road.